If we view other people’s lives from just social media or articles we read on blogs, we can be tempted to assume they have got it all together. When in reality, usually people are only good at a few things and they share things about themselves from their wheelhouse – things that represent themselves in the best possible light. We don’t typically share with one another the real struggles we have. The places where we feel less-than. The places where we recognize our deficiencies. This is part of the reason I have picked and I am so excited to start working on this Decluttering Step by Step journey this week with the Hope for Homemakers group. I started reading the book a little while back and immediately found hope in Sarah’s Ground Rules for the book. I mean, SERIOUSLY, this is a needed rule for life, not just clutter! Don’t you think? Sarah’s book is starting from a positive place by encouraging us to work through our OWN stuff on a physical and emotional level. She recognizes that each of us are unique. That means that our approaches to our clutter problems may not fit the cookie cutter “30 Days to a Clutter Free Home” programmes that never seem to get accomplished, much less maintained. And Ground Rule number one lets us know that our decluttering journey is not a competition. So, while we dream about a clutter free home, we have to look inward to find out if it is because it will really make us happier and freer in our own homes. And if it does, we need to push through the process and push away the negative thoughts as we continue the process for ourselves. Since we are part of a group (Hope for Homemakers), even this can be a temptation to compare ourselves and our progress with one another. But I truly hope that this group will be a POSITIVE INSPIRATION, like Sarah mentions in Ground Rule number one. And I think the only way that this will work in the positive for us is to speak words of encouragement to one another, devoid of judgment and unsolicited “advice.” As we work through this process, I think we will discover that everyone has a different tolerance for items in their homes. Some of us are minimalists by nature, some of us find comfort in a room filled with things we love. And there are, in the end, a lot of ways to make a house a home. I LOVE, LOVE, LOVE a clean, orderly room. I don’t collect a bunch of “things” other than books. On my dining room table right now are a whole bunch of Bible study tools (books) and preschool supplies and stray toys. The big project I am hoping to complete as part of this Decluttering Step by Step process is my husband’s office space and my office space. These two spaces are the most neglected rooms in our home, but the catch-all for all manner of things we have no idea what to do with. I will start Sarah’s steps by gathering the necessary boxes and bags and working 20 minutes in the space for 5 out of 7 days. I am going to set a timer. And I am going to follow Sarah’s rules. Do you want to join me? I would love it if you would! Leave a comment below letting me know what you LOVE, LOVE, LOVE your home to look like, what you collect, what’s on your dining room table, and the big project you are planning on working through during this process (the one we talked about last time). Are you new here? 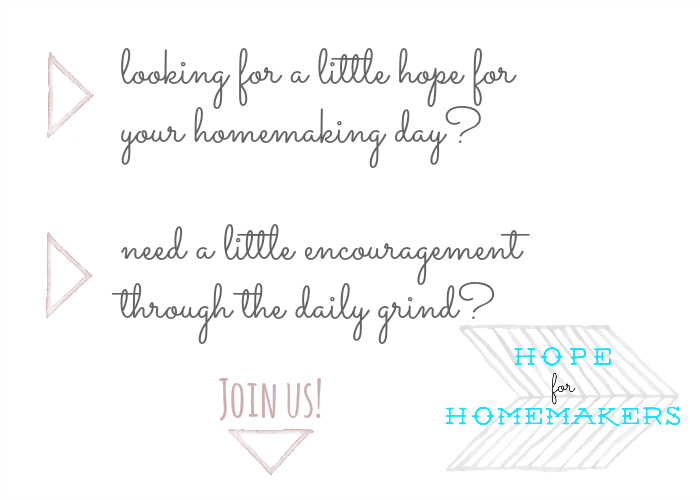 Come check us out on our Hope for Homemakers Facebook Page or subscribe to the Hope for Homemakers newsletter. Oh, and pick up a copy of Sarah Mueller’s book, Decluttering Step by Step – it is what we are working through together, right now! Yes, INDEED! Thanks for stopping by – I am loving the book!